Lady Leila was too stunned at first to react. And then she laughed. “How is he?” she murmured as she passed Odile to him. He seemed too merry to be carrying bad news, but Alred was known to laugh when he most longed to cry. 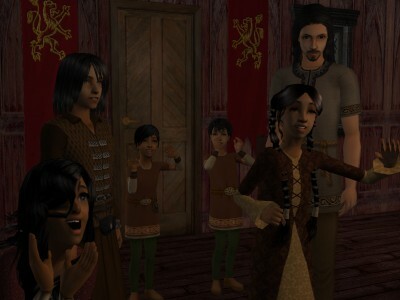 She heard cries of “Mama!” from all sides, except from quiet Cedric, who only stood smiling with shy happiness at her. But Cedric, who was nearly ten now, was old enough to visit her on occasion when a groom could be spared to ride with him. And he was generous enough to stand by and wait for that reason, so that she could greet her other children first, and she loved him for it. “I believe I shall start from oldest and hug my way down to littlest,” she said. “Somebody has to go first!” Aefen pointed out. Aering laughed at his brother, content in the knowledge that he was older and furthermore looked little enough like his dark twin that the charge of ugliness did not necessarily apply to him. Leila did not forget how beautiful Raegan was, and nevertheless it struck her like a surprise whenever she saw her. She and Leofric had made five extraordinarily beautiful and clever children. Everyone said so. It seemed like a sign that she and he had been meant to be brought together, though a king had died to make it possible. The truth was that Leofric seemed more and more to her like one of the gods of the ancient stories that he used to tell the children. Such gods would occasionally dally a while with a mortal woman, perhaps injuring her with their strength that they could never quite suppress, but always leaving her with magnificent, beautiful, godlike children. “I don’t forget, Mama,” six-​​year-​​old Lissa said. Lissa resembled Leila more than Raegan did, but she had an Englishwoman’s straight and handsome nose. She would be more beautiful than her mother, and Leila was only too happy to acknowledge it. Finally she went to her young twins, who had turned four in November on their father’s own birthday. 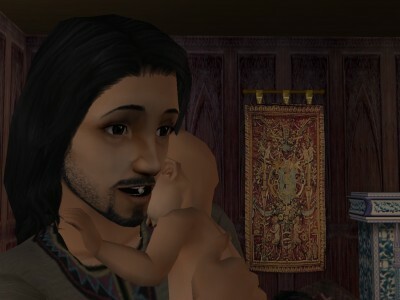 Soon five years would have passed since the birth of the last children Leofric would give her, but he had left her nothing to desire. Aering’s face was a handsome blend of Leofric’s and her own father’s, with precisely the most attractive features of each. Aefen was formed likewise from parts of Leofric and parts of her beloved brother. And they both had their father’s striking hazel eyes. “That is my pleasure and my honor, sir,” Alred said. “But I haven’t even greeted you, yet!” she laughed. “I wish it too. At times I am lonely, Alred,” she said wistfully. “Even now,” she agreed with a sad smile. I am glad Leila bitter towards Leofric, or still frightened, but I think "gods" do not make the best husbands. Yay!!! Leila is back she is looking more beautiful than ever. And her children are gorgeous. 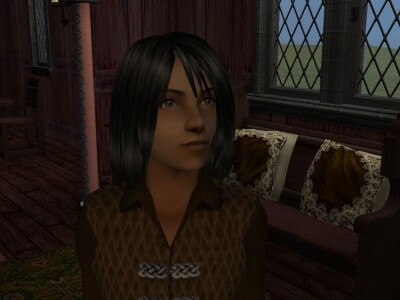 Cedric is going to be such a hottie. The children are cute. Terribly. Aww. 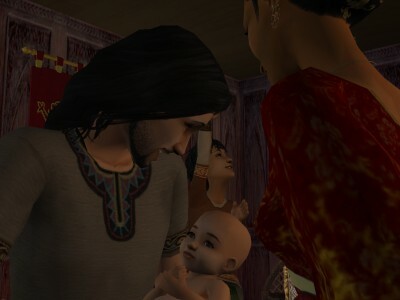 Why don't I get cute little Sim children? Mine have noses that are too ugly to be pretty and too boring to be characteristic like The Nose. Where did you get the hair Cendric has? He looks gorgeous! I always liked Leila. And those sure are some pretty children! Cedric is hot ! Somehow, I always though Alred could have end with Leila. He is one of the rare men to be fond of her. I often thought that too, Francois. Those two certainly do have a lovely friendship. They really understand each other, I think. Those are some cute kids! And I'm happy that some people still consider Leila a friend. There aren’t a lot of platonic, non-​familial male-​female friendships in Lothere (understandably, given the times – Alred + Gunnilda and Iylaine + Bertie are the only ones I can think of at the moment), and Alred and Leila’s friendship was always really special.